The clockwinding tradition originated when John Rigby and Sons, Ltd. of Manchester, England, presented the Wire Association with a 400-day grandfather clock at its Annual Convention in Pittsburgh, Pennsylvania, on October 20, 1948. The gesture, which represented a group of 32 companies from Great Britain, was made in appreciation of the support given by the U.S. wire industry to Great Britain during World War II. Each year a representative from the U.K. makes the trip to the U.S. to participate in the annual ceremony that commemorates the friendship and communication between the two nations. The clock resides in the lobby of the Wire Association International, Inc. headquarters in Madison, Connecticut. The massive mahogany case standing about eight feet high was made about the year 1770. The brickwork ornamentation of the plinth and clusters of fluted columns to the head are noteworthy features, the latter being quite unusual. The Corinthian capitals and other metal ornamentation are picked out with gold. As the dial door is not constructed for frequent opening, it seems very probable that this case was originally made for a three month or longer period clock. To open this door the two pegs at each side are withdrawn and the door frame lifted down. There are no hinges. Although about 178 years old, the case is in very good condition and has been carefully restored and processed against woodworm. The movement and dial have been newly constructed by the writer in keeping with the requirements of the case. The movement (of the clock) is designed to run for 400 days without rewinding. A small number of these year duration clocks were made in London in the early 18th century by the celebrated makers, Thomas Tompion and Daniel Quare, and there are also a few examples of provincial make and later date. 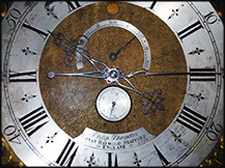 The year- long case clock was a luxury demanding too much skill in construction ever to come into general use although the aesthetic and practical value of an “anniversary clock,” as they could appropriately be called, are worthy of consideration. The older examples frequently required an 80 lb. weight to drive them. The maker of the present clock employed the general principles of the old craftsmen while introducing some of the facilities of later days such as Geo. Graham’s dead beat escapement and Skefko ball-bearings on the heavily loaded barrel arbor. Using, as it does, a 40 lb. weight, the efficiency of this clock becomes about 13 times that of a common eight day long case clock. The falling of the weight about one eight thousandth part of an inch keeps the clock going one minute during which time the pendulum travels about 135 inches. Pinions of 12 leaves are used throughout the train and the total gearing ratio is 34,560 to 1. Shafter maintaining power is fitted which keeps the clock going while being wound and prevents the key being inserted until the maintaining power has been put into operation. Double click-work is fitted to the barrel for safety in winding. The pendulum is an “Invar” rod with lenticular bob provided with graduated rating nut for coarse adjustment, and a small shelf for small weights, for fine adjustment without stopping the pendulum. A degree scale is provided, the escaping arc being 1 degree each side of zero and the swing arc about 1 degree, 30 minutes. The delicacy of a clock of this kind is shown by the fact that the hour hand, as well as the minute and seconds, has to be balanced. Guides are fitted to the case to prevent the flat weight from twisting. The lacquered brass and silvered dial is hand engraved and bears around the arch an ancient sundial motto reminding us that “Time can neither be kept nor destroyed,” “Tenere non potes nec perdere.” In the arch is a rotating sphere moon showing the phasing of the moon around which a hand points out the age of this luminary. The hour and minutes are indicated on the usual 12-hour circle, the seconds being given on a sunk seconds dial, below the center of the dial. The matted dial center is relieved by a segment of a circle on which are pointed out the number of days which have elapsed since the clock was wound. The hand pierced hands are of blue steel and the corner pieces are spandrels of brass, pierced in scroll work pattern, and finished to give a damaskeening effect. 1948—John Rigby Director, John Rigby & Sons Ltd.
1949—Reginald S. Brown Chief Metallurgist, Ryland Bros. Ltd.
1950—H. Richards Marshall Richards Ltd.
1951—Dr. Thomas Emmerson Director, GKN Ltd.
1953—Charles D. Gill Director, Spencer Wire Co. Ltd.
1954—C.P. Rigby Director, John Rigby & Sons Ltd.
1955—R.S. Bleckly & W.O. Copland Directors, Ryland Bros. Ltd.
1956—John M. Avison Director, Ramsden Camm & Co.
1957—Peter D. Gill Director, Spencer Wire Co.
1958—Harold W. Rigby Director, John Rigby & Sons Ltd.
1959—Douglas Gledhill Director, J.A. Binns Ltd.
1960—James F. Cowen Chief Engineer, BICC Ltd.
1961—C.F. Brereton Chief Metallurgist, RJN Ltd.
1962—S.W. Horton Director, The Firth Co. Ltd.
1964—Kenneth G. Hann Director, Somerset Wire Co.
1966—R.H.G. Askew Manager, Joseph Sykes Bros.
1967—Terence Cahill Director, Somerset Wire Ltd.
1970—John Siddall Director, Standard Wire Co.
1971—R.T.V. Hay Director, MRB Ltd.
1973—Raymond Ripley Chairman, Richard Hill Ltd.
1976—Michael Gledhill Director, J.A. Binns Ltd.
1977—G.S. Firth Director, Smith Wires Ltd.
1979—Peter J. Rigby Chairman, Rigby Maryland Ltd.
1980—Roger Matzen Director, Hi-Draw Machinery Ltd.
1981—D.S.W. Lee Director, Arthur Lee & Sons Ltd.
1982—Rodney Hill Manager, Bridon Ltd.
1983—D. Newbould Director, Tinsley Wire Ind. Ltd.
1984—Peter Johnson Director, RJN Ltd.
1985—W. Murray Tomlinson Chairman, MRB Ltd.
1986—Angus McDonnell Director, Bridon Ltd.
1987—Nigel A. Charles Director, MRB Ltd.
1988—C.P. Rigby Chairman, Rigby Specialty Wire Ltd.
1989—Terence Cahill Director, Somerset Wire Ltd.
1990—George J. Dickens Director, John Shaw Ltd.
1992—Darrell Fox Director, Foxton Wire Die Ltd.
1993—Dilwyn Scrivens Director, Tinsley Wire Ltd.
1994—Andrew G. Stacey Director, Bridon Ltd.
1995—Peter Wilcock Director, KTS Wire Ind. Ltd.
1996—David Young Director, Tinsley Wire Ltd.
1997—Terence Cahill Director, Somerset Wire Ltd.
1998—Peter J. Rigby Director, Handy & Harman (Europe) Ltd.
1999—Peter R. Siddall Chairman, Siddall & Hilton Ltd.
2000—Nigel Lane Director, Cold Drawn Products. 2001—Kenneth J. Scott Director, Holton Machinery Ltd.
2002—Alan Stephenson General Manager, Bridon International Ltd.
2012—John Swain, Siddall & Hilton Ltd.
2013—Jonathan Rigby, Fox Wire Ltd.
2014—Robert Bache, Bacher Pallets Ltd.
2016—John Churchfield, Bridon International, Ltd.